You may have seen some gremlins lurking on Facebook recently, because yesterday, Sudocrem's Save Christmas (#SaveChristmas) app officially launched on Facebook! It's now our time to help save Christmas by bashing them little Gremlins as soon as we see them, of course in return for not only saving Christmas, but for points to enter a fabulous giveaway too of course! It's the time of year when most of us start to feel the financial strain of Christmas, if you didn't have enough to buy for already, our siblings decide to have another baby, or your best friend does instead, or the shops inflate their prices like we found a money tree! So us compers, because after my comping luck this weekend, I've decided to try and enter more competitions, are trying our luck in trying to win some Christmas presents! Luckily, I've found some brilliant competitions, and I have to share them! 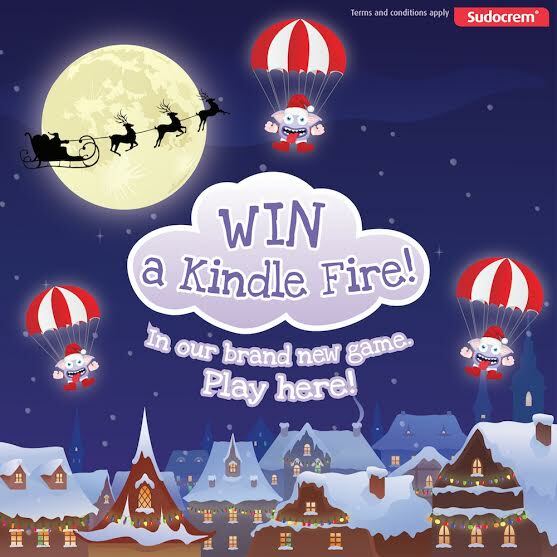 First up is this amazing competition from Sudocrem, the game is very easy! You just click on little nappy rash gremlins and their parachutes and help #SaveChristmas! Each gremlin you click on gives you one point each time, but be careful not to click on the presents as they will loose you one point each time! Reach 40 points before the time (60 seconds) has run out for your chance to win some amazing prizes! Instant prizes include Amazon Kindle Fires, Amazon Vouchers, Miffy prizes, Milton prizes, Aquabeads prizes and many, many more! 1: Search or find Sudocrem on Facebook: www.facebook.com/sudocrem and like the page! 2: Click on the Save Christmas app. 3: Beat the Nappy Rash Gremlins and avoid presents to earn points. 4: Score 40 points in 60 seconds, and be in with the chance of winning an instant prize! 5: Play the game everyday for the chance to win, and earn extra game plays by liking and following on other social media platforms! I've played the game four times now, and haven't been lucky just yet! Negative thinking get's us no where though, and so, it's positive thinking from me to you!